Be Careful What You Wish For...Part Deux? Discussion in 'TalkCeltic News' started by Mr Shelby, Apr 26, 2018. Getting one over your fiercest rivals tends to be sweet at the best of times. Indeed, thumping their next door neighbours has become somewhat of a familiarity for this Celtic team over the past few years, with last week's dominant 4-0 Cup win being the 10th straight undefeated game against Murty's mob. This coming Sunday however, Brendan Rodgers' record breaking side have yet another opportunity to write their names into the history books. With a win against Rangers, the Hoops will seal 7-in-a-row, not only taking a step closer to the mystical '10' AND -potentially- a back to back treble, but also rubbing their rivals' noses firmly in it in front of a packed out Celtic Park. Undoubtedly, both the players and manager will have been dissapointed at failing to seal the trophy against Hibs at the weekend (despite what any conspiracy theorists might think). It was a very below average performance, in what has been a season full of inconsistency problems, which is perhaps not overly surprising considering the side's insane exploits last term. Many of the big hitters from the Invincible season have struggled to regain their blistering form, with Scott Sinclair looking particularly out of sorts of late, despite his statistics once again proving to be impressive. 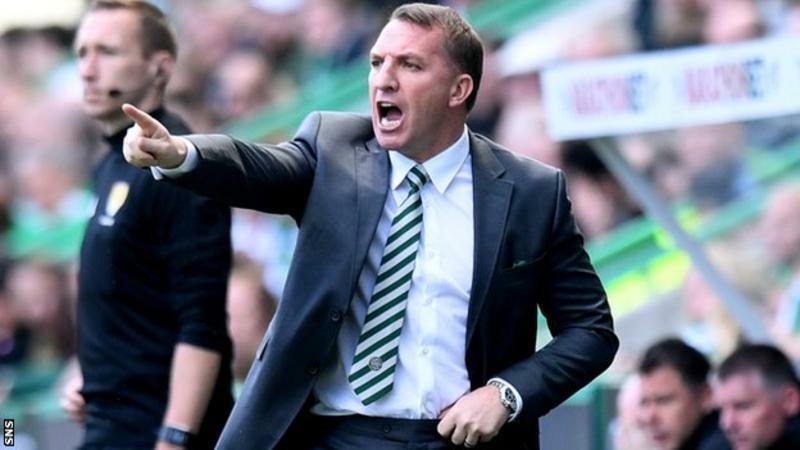 By Rodgers' own admission, the football has not always been what we had come to expect following the often all action, swashbuckling style witnessed in 16/17. 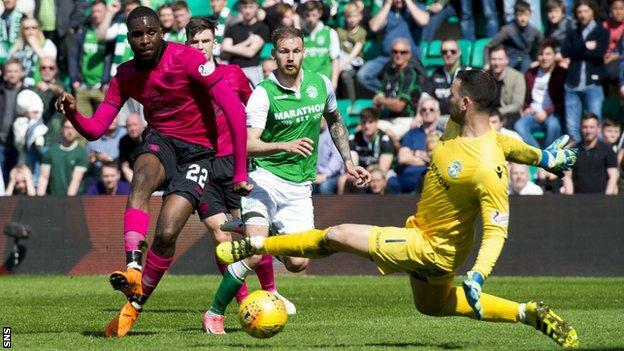 On Saturday Lennon appeared to have Celtic 'sussed', the team failing to ever really get into their stride, with the Leith side deservedly walking away with the 3 points in the end. Nonetheless, the job has still been done, almost. The League cup is in the bag, the league is all but and a Scottish Cup Final once again awaits, with only Motherwell appearing to stand in the way of an unprecedented 'double treble', something never before achieved in Scottish football. Taking all that into account then, it is perhaps harsh to overly criticise the players, but I am convinced that Rodgers will be demanding the levels to be upped once more on Sunday, in a game that, despite the Hoops being overwhelming favourites, is by no means a given. 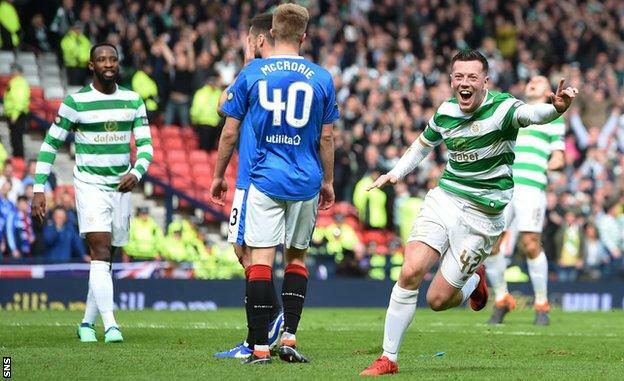 Celtic fans will be hoping that the players can once again draw upon the inspiration handed to them by Graeme Murty and his players, who famously 'cheered' following the Scottish Cup Semi-final draw (looks a bit silly now lads, doesn't it). The 4-0 win at Hampden was one of the most emphatic yet, if not the most. Of course, we all enjoyed the 5-1 game(s) last season, however this was different. Rangers never had a sniff - barring a 5 minute action spell following McCrorie's red card - and both the players and fans in the stands looked utterly dejected. I suspect they will not be overly excited at the prospect of travelling to Celtic Park on Sunday, just a fortnight following such a trouncing. However, there remains a job to be done for the Celtic players, regardless of their opponents constantly deteriorating mindset, and knowing Rodgers as we all do, preparation and professionalism heading into the game will be of paramount importance. The manager's team selection will once again be of interest, as it has been throughout the season. Often through no fault of his own, Rodgers has been forced to change the face of the side. Last year, you could pretty much nail the first XI most weeks, but this time around it has been more difficult. Injuries and lack of form have hampered the team selection for much of the season and it could be debated over whether or not this has played a part in many of the flat performances we have witnessed, particularly before the turn of the year. Thankfully, every key player is now back fit and with a number of future's still uncertain at this stage, it will be intriguing to see who receives game time throughout the remaining fixtures. Patrick Roberts for instance, has endured a frustrating return to the East End of Glasgow. The jinking winger remains a fan favourite, yet following such fanfare surrounding his return for a 2nd full season with the club, as well as him being handed the number 7 jersey, he has struggled for form. Granted, injury has once again played a significant part, due to a horror hamstring injury. He is at a crucial point in his career now however, and following two and a half years in Glasgow, I personally have my doubts over whether or not he will return once more next season. That being said, in my own opinion once again, I would like to see him given a starting berth on Sunday. As excellent as James Forrest has been this season, it is evident that his form of late has tailed off and he is not exactly known for being a big performer in these games at the best of times. I feel the time is right to give Roberts a chance, particularly as the season continues to wind down, we may not have much more of an opportunity to enjoy the genius which the diminutive winger can so often offer. Rangers' most significant weaknesses are at the back and in front of a roaring crowd on the big occasion, it could be the perfect opportunity for Roberts to - potentially - sign off in style. There really is a debate to be had all over the park and I could sit and write screeds regarding the forward positions, centre midfield, left wing, number 10 etc, etc, you get the picture. This is not a bad thing of course, and if anything highlights the strength in depth currently at the club. For me, however, the biggest concern still remains at the back. Since Rodgers has arrived he has appeared tentative in regards to making major changes to the defence, with the likes of Boyata, Simunovic, Gordon and Lustig all still being regulars throughout his 2 seasons here so far. All have endured mixed periods of form, but this season in particular have caused concern more often than not. In recent times, Rodgers has often shifted to an unorthodox back 3 shape, with recent addition Jack Hendry seeing a good amount of minutes on the far right hand side. Personally, I am unsure on this. I feel the lack of a natural RB who will continually bomb forward, similar to the methods employed by Tierney on the left, has affected our fluidity this season. In the past, Lustig could offer a lot more, but unfortunately it appears that his time as a regular starter is nearing an end. I feel that the 3 at the back shape leaves us too exposed, particularly down the flanks and allows teams to target certain sections of our defence, which opposition managers clearly view as a weak point. This was evident at the weekend vs Hibs, with a number of long balls, both diagonally and straight, causing us trouble time and time again, allowing their two forwards to nip in. On the plus side, the emergence of Kristoffer Ajer as a reliable presence at the back has undoubtedly eased some concerns amongst the Celtic support, myself included. The towering Norwegian appears to be a tremendous piece of business, something we can thank Mr Ronny Deila for. His composure, stature and ability to stride out from the back is eerily reminiscent of a certain Dutchman, now plying his trade down South as the world's most expensive defender. It is still early days, but the 19 year old has firmly nailed down his starting position within the side, and has been imperious every time he has faced Rangers. His aforementioned age though, must still be taken into consideration, and, the others around him such as Boyata, should be putting in more consistent performances. The big Belgian's unpredictability is a serious concern, and I must admit I am slightly bemused by how highly Rodgers appears to rate him, with him almost certain to start again this weekend, despite how many of us may feel. I feel his consistent game time is largely down to us having trouble with the likes of Simunovic and Compper, however. The former has drifted out of the picture and his confidence appears to have taken a severe hit following that game at Tynecastle earlier in the season. The latter, well, I am beginning to wonder if he even exists? For this weekend though, I expect the defence to revert back to that which started during the 4-0 victory at Hampden, with Lustig returning to make it a '4' once again, with the ever reliable Tierney being the one, along with Ajer, to hold things together. It is without doubt an area we must look to freshen come the summer. Additionally, I also expect the midfield and forward positions to remain the same as in that match. The likes of Moussa Dembele, Callum McGregor and Tom Rogic have all enjoyed tremendous success in these games of late, and it is likely that Rodgers will put his trust in the 3 of them again to provide the spark needed to get his side going. McGregor in particular appears to excel in this sort of atmosphere and has become a reliable worker and team player. Dembele, as we all know, enjoys a goal in this fixture. That majestic panenka penalty at Hampden was his 7th goal overall against Rangers, and he will no doubt be looking to add to that come Sunday. Indeed, both him and his fellow Frenchmen Oliver Ntcham and Odsonne Edouard could all play an important role in the game, with both of the latter having enjoyed special moments in the past 2 derby fixtures. Leigh Griffiths is still on the hunt for 2 more goals to finally reach the 100 tally for the club, an incredible achievement. As sweet as it would be for him to notch both this weekend - and he yet might - it is unlikely he will start ahead of Dembele in the central striker role, with the Frenchmen often being the man of choice for Rodgers on these occasions. Despite the discussion over team selection, form, injury and so on, the fact remains that if Celtic 'turn up' on Sunday, they will have far too much for their opponents to cope with. As noted beforehand, the strength in depth within this squad at the minute is unparalleled in Scottish football. That was witnessed in the last game, with Griffiths, Roberts and Sinclair all coming off of the bench in the 2nd half. It is a depth and quality that Rangers and every other team in Scotland can only dream of. Rangers head into this game in complete disarray, both on and off the park, and it would be a tremendous shock if anything other than a Celtic win was to happen. Any time Rodgers' side have been tasked with a big game in the past 2 years, they have delivered, and following the disappointment of Saturday afternoon, I fully expect us to get the job done here and finally seal yet another title against what is a weakened, mentally drained Rangers team. No matter where in the world you are watching it, stay safe and enjoy. It is all set up to be an unforgettable day. Wee Jamesy, Devlin, Marty McFly and 1 other person like this.